Edward Vincent Sullivan (September 28, 1901 – October 13, 1974) was an American, entertainment writer and television host, best known as the emcee of the popular and influential TV variety show called The Ed Sullivan Show that was at its height of popularity in the 1950s and 1960s. Between the years 1948 and 1971, nearly everyone who watched television saw The Ed Sullivan Show. Even non-regular viewers often tuned in Sullivan occasionally to see their favorite singer, comedian, or celebrity. Although awkward in manner, stiff in appearance, and lacking charisma, Sullivan introduced a generation of Americans to the truly important trendsetters in the arts, entertainment, and popular culture. His show was an extension of vaudeville tradition that went counter to contemporary programs appealling to a narrow demographic group. Instead, Sullivan played to the widest possible audience, booking acts across the tremendous range of entertainment. On any given night, viewers could see performers of the classics such as Itzhak Perlman, Margot Fonteyn, and Rudolf Nureyev; comedians such as Buster Keaton, Bob Hope, Henny Youngman, Joan Rivers, and George Carlin; singers such as Elvis Presley, Mahalia Jackson, Kate Smith, the Beatles, James Brown, the Singing Nun, and The Doors. With the often-imitated, opening line, "tonight we are going to have a reeeeeelly big show"—pronouncing the last word as "shoe"—Sullivan become a national institution who made up for his lack of screen presence with his gift for finding and showcasing the era's brightest new talent. A former professional boxer, Sullivan began his media work as a newspaper sportswriter. When Walter Winchell, one of the original gossip columnists and the most powerful entertainment reporter of his day, left the New York Evening Graphic for the Hearst syndicate, Sullivan took over as theater columnist for the paper, and later for The New York Daily News. His column concentrated on Broadway shows and gossip, as Winchell's had and, like Winchell, he also did show-business, news broadcasts on radio. Sullivan soon became a powerful starmaker in the entertainment world himself, becoming one of Winchell's main rivals, staking out the El Morocco nightclub in New York City as his unofficial headquarters against Winchell's seat of power at the nearby Stork Club. Sullivan continued writing for The News throughout his broadcasting career and his popularity long outlived that of Winchell. 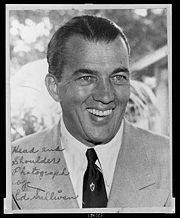 In 1948, the CBS network hired Sullivan to do a weekly Sunday night TV variety show, Toast of the Town, which later became The Ed Sullivan Show. The show was broadcast from CBS Studio 50 on Broadway in New York City, which in 1967 was renamed the Ed Sullivan Theater (and is now the home of The Late Show with David Letterman). Somehow, Sullivan still seemed to fit the show perfectly. He appeared to the audience as an average guy who brought the great acts of show business to their home televisions. "He will last," comedian and frequent guest Alan King was quoted as saying, "as long as someone else has talent." Sullivan had a healthy sense of humor about himself and permitted—even encouraged—impersonators such as John Byner, Rich Little, and especially Will Jordan to imitate him on his show. Johnny Carson also did a fair impression of him. These impressionists tended to cite his somewhat nasal voice along with some of his commonly used introductions, such as "And now, right here on our stage..." and "For all you youngsters out there...." Will Jordan has portrayed Sullivan in I Wanna Hold Your Hand (1978), The Buddy Holly Story (1978), The Doors (1991), Mr Saturday Night (1992), Down With Love (2003), and in the 1979 TV Movie "Elvis"
There was another side to Sullivan: he could be very quick to take offense if he felt he had been crossed and could hold a grudge for a long time. Jackie Mason, Bo Diddley, and The Doors became intimately familiar with Sullivan's negative side. On November 20, 1955, Bo Diddley was asked by Sullivan to sing Tennessee Ernie Ford's hit "Sixteen Tons." When air time came, however, Diddley sang his number two hit song, "Bo Diddley." Sullivan banned him from the show in retaliation. Jackie Mason was banned from the series in 1962. Sullivan gestured that Mason should wrap things up and Sullivan believed Mason replied on live television by giving him "the finger." Videotapes of the incident are inconclusive as to whether Mason's actually did this or not. The Doors were banned in 1967 after they were told to remove the lyric "Girl, we couldn't get much higher" from their song "Light My Fire" (CBS censors believed it was too overt a reference to drug use) and sang the song with the lyrics intact. The Rolling Stones were a different story; they were forced to change the chorus of "Let's Spend the Night Together" to an incomprehensible mumble, or by some accounts, "Let's Spend Some Time Together." Lead singer Mick Jagger deliberately called attention to this censorship by rolling his eyes and mugging when he uttered the new words. Unlike many shows of the time, Sullivan asked that musical acts perform their music live, rather than lip-syncing to their recordings, leaving a lasting record of rare live performances in many cases. Some of these performances have recently been issued on CD. The act that appeared most frequently through the show's run was the comedy duo of Wayne & Shuster making a total of 67 appearances between 1958 and 1969. Sullivan was not the first to feature Elvis, however, and he was determined to be firsts if such an opportunity presented itself in the future. In 1964, Sullivan achieved that with the first live American appearance of The Beatles, on February 9, 1964. This show was the most-watched program in television history to that point, and remains one of the most-watched TV programs of all time. The Beatles appeared several more times on the Sullivan show; Sullivan struck up such a rapport with the Beatles that he agreed to introduce them at their Shea Stadium concerts in August 1965. By 1971, the show was no longer in television's top 20. New CBS executives, who wanted to attract younger viewers, canceled the show along with virtually all of the network's oldest programs. Sullivan was so upset and angry he refused to do a final show, although he did return to CBS for several TV specials and a 25th anniversary show in 1973. One year later, the man known as "Old Stone Face" died of esophageal cancer at age 73. Ed Sullivan is interred in a crypt at the Ferncliff Cemetery in Hartsdale, New York. Sullivan was married to Sylvia Weinstein from April 28, 1930 until her death on March 16, 1973. They had one child. Sullivan was in the habit of calling Sylvia after every show to get her critique of that evening's show. 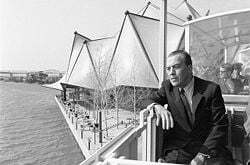 Since The Ed Sullivan Show stopped running in 1971, no other program on American television has approached the diversity and depth of the weekly variety show, or has appealed to such a wide range of viewer tastes and interests. Periodic specials drawing from the hundreds of hours of Sullivan shows as well as the venue of The Late Show with David Letterman continue to serve as tribute to the emcee's unique place in broadcasting. In the fall of 1965, CBS began televising the weekly Sullivan programs in RCA's color process. Although the show was seen live in the Central and Eastern time zones, it was taped for airing in the Pacific and Mountain time zones. Fortunately, most of the taped programs (as well as some early kinescopes) have been preserved and excerpts have been released on home video, taken from specials hosted by Carol Burnett. Sullivan paid for the funeral of dancer Bill 'Bojangles' Robinson out of his own pocket. He also defied pressure to exclude African American musicians from appearing on his show. At a time when television had not yet embraced country and western music, Sullivan was also adamant about featuring Nashville performers on his program. This insistence paved the way for shows such as "Hee Haw" and variety shows hosted by country singers like Johnny Cash and Glen Campbell. 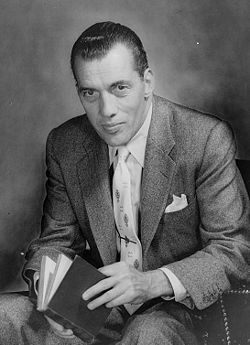 Ed Sullivan remains an important figure in American broadcasting because of his talents as a producer to have been able to find and showcase so many important, new acts and for his willingness to chip away at the entrenched racism that existed in television's first decades. Sullivan has a star on the Hollywood Walk of Fame at 6101 Hollywood Blvd. Ed Sullivan at the Internet Movie Database www.imdb.com. This page was last modified on 25 September 2017, at 22:12.